Martial arts folklore is filled with stories on the origins of the Black Belt and because many martial traditions were passed down orally, written evidence is sketchy at best. 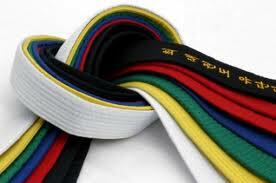 There is little doubt, however, that colored belt ranking systems became popular with the rise of martial arts in the United States and continues to this day. Further, belts and clothing have evolved differently over time, within the geographies of Asia. 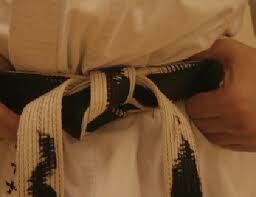 A sash differs from a belt in both form and function and is worn predominantly in Chinese martial arts. So it’s safe to say that the iconic “Black Belt” probably has its origins in Japan, with the formalization of sport and academic martial arts programs, during or after the Meiji Restoration. Regardless of its origin, the Black Belt has become a worldwide symbol for excellence and a metaphor for achieving a state of spontaneous right action, aka Mastery. The wearer literally sees the belt transform over time with their experience. As one moves from mental and physical states of unconscious incompetence to that of; the conscious incompetent , then the conscious competent, the belt physically changes in a congruent fashion. Both belt and wearer come full circle as the student achieves unconscious competence and a “beginners mind”, while the belt physically returns to the purity of a white belt. The interesting thing is that this metaphor can be applied to any process of skills development and is not historically restricted to Eastern culture. The Western process of going from “apprentice” to “journeyman” to the master craftsman is very similar, just no tattered black belt to carry around. The popular Black Belt Story goes like this…..On the first day of training, the eager young student is given a uniform and the white belt from the Master Instructor. The uniform must always be kept clean, folded a certain way and there is even a specific method to pack it up for transportation. The white belt, however, must never be washed. First, in the modern era of dryers it will shrink up like a bow tie and will never fit again. More importantly, that belt becomes the visible symbol of the young student’s hard work and accomplishments which cannot, which must not be washed away. With training, sacrifice and the development of personal discipline the eager student develops a solid understanding of the fundamentals and the belt shows visible signs of this experience. It begins to yellow, then turn shades of green or brown depending on the geography of the training. It will even pick up occasional blood stains from intense moments and take on the shades of red. After years of study and thousands of repetitions of basics, the belt begins to gray….and eventually turn black. After decades the belt begins to wear and fray along the edges. The stitching comes loose and the white interior becomes exposed. The combination of the white and the black material, the old frayed edges and the fresh, newly exposed interior of the belt become the symbol of the now experienced and mature student. A student of both mastery of the fundamentals and newly discovered wisdom and maturity that always existed within and are now surfacing. It also represents the cyclical and circular path of mastery. Contrary to how it is viewed in the Western World, earning a black belt represents only a first step towards mastery. After a lifetime of the pursuit of excellence, the outer surface of the belt has all but worn away. Sometimes it’s almost completely shredded with very little sign of the original texture….and now it’s white again. The belt is no longer the same piece of fabric it once was, it has at the same time transformed to something new yet returned to its humble beginnings as a white belt. It has become the symbol of the lifelong experiences of the now Master. It is interesting to note how today’s culture has begun to identify the Black Belt as having already mastered a set of skills. Even the martial arts world has become confused on what it signifies; some schools insisting that earning a black means the absolute success in the ability to defend one’s self. 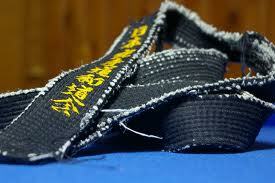 Still others have rejected the Black Belt all together as some archaic, artsy tradition with no practical value. The commercialization of martial arts schools hasn’t helped the cause either. Some cultivate the atmosphere that every student is a champion, all the time and brings home a trophy, which is of course unrealistic. The wisdom gained from the experience of adversity and failure is almost a taboo subject. It has almost rendered the black belt story inert and the belt itself simply a piece of ceremonial jewelry. This loss of meaning has moved people away from the tradition of self-mastery and the life learning cycle. Further, the business world has adopted the Black Belt as a title to put on a business card after nine months of training on post WWII process improvement. It’s frustrating to hear the terms Black Belt and Master Black Belt associated with Six Sigma and Lean Logic training. Granted there is great value in the principles that evolved from the teachings of Dr. Edwards Deming. It would not be appropriate however , at least to the academic community, to award a Master’s Degree, a Doctorate or a PhD in such short-lived training. Neither would it make sense in the military to promote a soldier to Captain right after they have completed basic training. It just isn’t done. In Japan and Okinawa, it was generally accepted that there was an average time frame of 3-5 years to “apprenticeship” or to the promotion to 1st Degree of Black Belt. This new Black Belt would be considered equivalent to the “rookie” in a police department after completing academy training. What would follow are the nine levels of development to 10th Degree Black Belt, with each level requiring a minimum of years of study, associated with that rank(i.e. two years for 2nd, three years for 3rd, etc. As mentioned, the experience timeline is similar to the medieval tradition of the apprentice, to journeyman, to craftsman, to master craftsman or in modern academics of Bachelors, to Masters, to PhD. The uniqueness being that the development of the Black Belt combines both the physical development of the craftsman, the mental development of the academic with the character development found in both disciplines. It’s the development of the practical with the theoretical. Ultimately, one can ask how or why modern culture has departed from these traditions but it may be more significant to ask, where to now? Where will the focus be throughout this decade? The fact remains, students graduate from college with a Bachelor’s degree and a sense of entitlement. Often they have the perspective that their education has completed instead of just begun. Master craftsmanship has been more about technology and gadgets; less about skills, artistry and experience. Dedicated, long-term study has been replaced by instant information, instant gratification and technology addiction. Is it then possible to weave the Black Belt Story into this global economic, information age? There is no going back to yesterday, but some principles remain time-tested and timeless. They can be adopted to any culture, any social, educational or business model at any time period. The true tradition of Black Belt Mastery is more relevant and necessary today than ever.